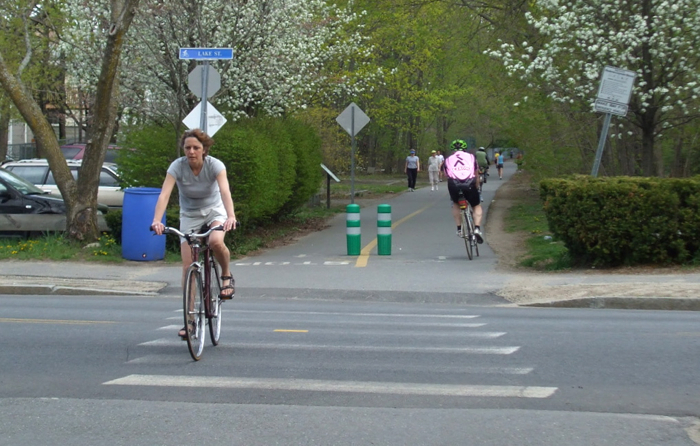 A plan for a traffic signal that would halt bicyclists and pedestrians where the Minuteman Path crosses Lake St. will have its second and final public hearing on Tuesday, October 17, at 7 PM at Town Hall. The Minuteman and Lake St. in a less-congested hour. View is towards Spy Pond. Photo: Phil Goff. The design features a traffic signal with a 70-second cycle, 14 of which would provide a green light for pedestrians and cyclists on the path during peak periods. In addition, the design would make changes to the path itself. The plan was conceived to speed motor-vehicle traffic on Lake St. at peak times. Proponents claimed the most dramatic benefit for inbound traffic during the evening commute. However, advocates now say the new design would improve transit for all users. The Town has made the so-called 75% plans for the project available online. The only other public hearing, on July 26, drew about 55 people, according to YourArlington.com. The project has grown in scope and cost, from $150,000 to $400,000, since the Board of Selectmen authorized the design process in February of 2016. Estimates of the traffic benefits have shrunk from a 7-minute time savings during the evening commute to 4 minutes. The Selectmen will vote on whether to approve the final design. Some key features of the proposed signal are as follows. The Minuteman would widen at Lake St. to be nearly as broad as the road it crosses, separating into segregated bicycle and pedestrian lanes. Trees would be removed from the path near Lake St. to improve sight lines. The path would be made to curve as it approaches Lake St. from Spy Pond, and there would be traversable but textured median areas on the path at the approaches to the intersection. Path users will see both a bicycle signal that cycles green-yellow-red, and a walk signal with the traditional walk-blinking-don’t cycle. The green and walk phases will coincide within a half second and last about 14 seconds, with another 6 seconds or so for a transition (yellow and blinking “Don’t Walk” signals, plus a short clearing period when everyone at the intersection gets red). The green phase for Lake Street is about 44 seconds. During peak times, the signal will be synchronized with the nearby traffic signal at Brooks St., delivering both green lights to Lake St. vehicles at the same time. Similarly, the 14-second green period on the Minuteman will match the same for vehicles at Brooks. At other times, when traffic is generally light, the two signals will be unlinked and the Minuteman signal will not be on a fixed cycle. Instead, the bicycle and pedestrian signals will be activated by multiple means, including cameras, generally within 5 seconds of detection. Proponents say that if cyclists slow as they approach the intersection, the cameras will in most cases trigger the green signal before cyclists reach Lake St. There will also be a button to press to activate the signal, though by some accounts it will not be needed. The signal will however run all the time. It will not (normally) change to blinking yellow and red at off-peak times. The plans also show that pedestrians on Lake Street, who include children walking to and from the Hardy School, will for the first time get a walk signal to cross the Minuteman: walk, blinking, don’t. There will be pedestrian-scale lighting added to the Minuteman-Lake intersection. The plan calls for radar-feedback speed limit signs (that tell you how fast you are going) on the Lake St. approaches to the intersection. At Brooks eastbound (coming from Orvis Rd. ), an electrically illuminated “No Turn On Red” sign will be deployed during the pedestrian walk phase there, and at all times during school pickup and drop-off. Otherwise, the sign will be off and right turns (after a stop, and yielding to others) will be permitted. Only one other change is planned for the Brooks St. signal, the addition of a left turn arrow from Brooks westbound onto Lake. Advocates of the signal hope to qualify for funding from the state’s Complete Streets program by emphasizing benefits to pedestrians and cyclists. Do not blink, or you will miss this one. It is no bad thing to move quickly: the process for the Mass. Ave. Project was so drawn out that it sometimes seemed to disenfranchise all but the most ardent voices. But if you care about this, make a point to review the plans and come to the October 17 hearing. This is an expensive project, but one that is strangely timid about a significant source of Lake Street congestion: the Brooks St. intersection. Arguably, a peak-hour prohibition on left turns there would do as much or more to speed traffic as the Minuteman signal, at least in the evening. Proponents, hoping to qualify for Complete Streets funding, are rebranding the signal as a safety project. This is disingenuous.There’s always room for improvement, but the number of reported collisions there has been small for such a busy intersection. That said, I think many cyclists and pedestrians would welcome a more orderly crossing, where today too often motorists and cyclists both behave poorly. Is the Town willing to pay for this improvement if it must use its share of regular highway funds? $400,000 is a pretty big chunk of change for benefits that have, in my view, been oversold. Given how many cyclists ignore stop signs and pedestrians ignore Don’t Walk signals, I worry that spending $400,000 won’t fix that. So, I too am skeptical about the hours of time saved for Arlington motorists and resulting decrease of greenhouse gas emissions. Hopefully, a green light for motorists will keep them from stopping for scofflaws who count on old school Boston driving techniques like looking not to stop in order to get others to yield to them. I could not find a MassDOT project number for this. Does that mean the money is only coming from the Town’s Ch. 90 road maintenance funds and the Town budget? It would take time to get it on the TIP and get other funding sources. I would say that bad behavior by motorists and others at this crossing has co-evolved. But if the signal will solve the problem, the question of who started it is purely theological. Do not quote me (because I may be wrong), but I do not believe this has been funded yet. Proponents hope to fund the project with a Complete Streets grant. I don’t even know where to track that, do you? Yes, looks unfunded. It might qualify for CMAQ (“See-Mack”) federal funds which were also used as part of the Mass Ave. funding. The primary requirements are that a project decrease air pollution and that it NOT increase capacity. Decreasing motorist waiting decreases air pollution. A project would need to be submitted to the Boston MPO and its CTPS. Then it has to compete with other proposals on a point system. The project might need some more features to gain points to get ahead of projects from other towns, like putting bike lanes on Lake Street within the project area, ie. between Brooks and the Minuteman crossing – probably costing the grassy buffer between sidewalk and street. Probably not a bad thing anyway, giving a safer alternative to riding on narrow Lake Street. Still, before spending $400,000, I’d like the Town to try inexpensive measures like putting big stop signs on left and right sides of the bike path at the intersection, signs in advance to cyclists warning to Slow- Stop Ahead, and paint on the path with a stop line, triangle line warning of stop ahead, and crosswalk paint marking where Lake Street pedestrians cross the Minuteman. Since getting state/federal funding could take years to get, I encourage the Town to implement the inexpensive measures above between now and spring if applying. As for brush clearing around the mouth of the Minuteman, I have mixed feelings. Cyclists should always be stopping and giving them visibility to Lake Street would more tempt them to not stop if it looked clear. On the other side, what we don’t want are drivers slowing for possibly fast moving cyclists and the added visibility might make more of them slow/stop for scofflaw cyclists who may or may not jam on the brakes at the last moment. This is a badly needed piece of infrastructure. I am commute both on the bike path and on route 2, and I avoid this intersection in car OR bike because it is so badly designed. Also I know it causes a lot of frustration and anti-bike sentiment in the non-bikers who are trying to get down Lake street. I think Arlingtonians are well-trained on how to use a traffic signal, it works elsewhere on the bike path (mostly, except for the idiot class of bikers who think they are too ˋcool´ to wait for a signal). Edie, although I am skeptical about some aspects of the project (like how much time it will really save, and at what cost), I think it will “work” as an intersection. But everyone is going to have to be careful there in new ways because cars and cyclists will be moving that much faster. I welcome the additional signal features at Brooks, though I think more could be done at that intersection to improve safety. Given the other bottlenecks along Lake (Brooks, the Mass. Ave light), I expect this will just be a wash. It would be very surprising if it improved travel time by four minutes, given the pent-up demand for other routes around Alewife. Even if it somehow did, $100K/minute is a hefty price tag. I’m not sure how one could sell this as Complete Streets, given how little is actually aimed at improving pedestrian safety and how much is about trying to improve travel times. Given that cut-through traffic down Brooks will almost surely increase as Mass. Ave. becomes the more pressing bottleneck, it seems that pedestrian safety may even be diminished. A four way stop-sign at the path would be just as effective, I feel, and would put an imprimatur of approval on what already happens at that intersection. Ray, I think a four-minute improvement from a single signal would be huge. Remember, that would be $100k per minute for hundreds of drivers every day forever. No wonder the Selectmen went ahead with this. It’s probably not going to work out nearly that well, for some of the reasons you suggest (and others). And my native cynicism says we will be lucky to get this job done for $400k. I hope people do not wind up being disappointed. Ideally Cambridge and DCR would stop fighting progress/motorists for the past 50 years and allow widening of Fresh Pond Parkway or at least adding 2nd left turn lanes at the Mass. Ave. intersection to reduce pressure on Lake Street. Little chance of reality striking them – they will just permit more housing construction anyway. A four way stop would be disastrous, congesting Lake Street even more and producing more air pollution as a result. This can even be modeled in simulations to reduce guesswork. Maybe a 4-way stop could drive more traffic to Rt. 16, turning it into gridlock and then eventually being too hard for Cambridge/DCR to ignore. Five or ten years of Arlingtonians and Cambridge workers suffering might then get them to relent. Instead, by making Lake less painful to drive, it will draw more traffic from Rt. 16 so fixing it could be delayed, assuming Cambridge cares at all about motorist suffering and the resulting air pollution from vehicles idling in traffic. Improving Mass and Brooks Aves can be follow-on projects as they become the new bottlenecks when Lake is improved. Easiest fix is to move the bus stop from in front of Capitol Theater a block or two east. Sadly, Selectmen refused to narrow the Lake Street sidewalk on the Capitol side to widen the intersection slightly and also refused to lengthen the right turn lane to go east on Mass from Lake because it would cost 1-2 trees, but get a few more cars through per cycle (MassDOT suggestion). At the previous hearing, several people suggested adding a left turn lane on Lake to turn on to Brooks for drivers headed from Rt. 2. This does block traffic, but needs road widening and likely eminent domain land taking. Adding capacity for more traffic on Lake to reduce it on Rts. 2 & 16 makes absolutely no sense. Why would Arlington want to encourage more traffic in the town, particularly when it’s just passing through? I disagree that a four-way stop would be disastrous. It’s already close to that during rush hour, as cars yield to the stream of pedestrians coming down the path. When it’s not rush hour, there’s not nearly as much traffic. The throughput of the stop signs is enough to keep up with demand. The proposed plan does not add capacity to Lake Street, it remains one lane each direction. Goals for reducing backups include improved air quality, improved quality of life for residents, and less time wasted that could be spent productively or with family. A four-way stop isn’t a matter of opinion – it can be scientifically modeled. I agree its sort of like a 4 way stop now with only Lake traffic stopping and cyclists ignoring their stop signs. Instead cyclists should stay stopped and wait for a gap in Lake traffic to go, like when the light at Brooks turns red. Hence, 4 way stop is causing big backups and wasted time people rather spend with their kids. Those are the goals, but the best laid plans… We’ll see if they even get 4 minutes of shortened travel times (I am skeptical). If they do, it could easily be to the detriment of actual Arlington residents, as cut-through traffic on Orvis & Brooks increase. Honestly, the best thing to do for residents is to make Lake less attractive as an alternative to the Alewife interchange. Maybe the traffic light at Route 2 and Lake should be strictly metered in the mornings and evenings. supposed benefits of doing so will accrue to non-Arlington residents (notwithstanding the “think of the children/families” arguments, which are a misdirection, at best).